Financial incentives set by Member States, such as taxes, can drive reductions in average CO2 emissions from new passenger cars in Europe. This briefing describes how these measures affect the sales of vehicles with lower CO2 emissions and examines the extent to which differences in average CO2 emissions between countries may be attributable to differences in the taxation and incentives systems in place. In 2016 most EU member states employed incentives or taxes based on emissions to steer purchasing decisions on cars. The number of countries offering incentives for electric vehicles increased considerably between 2010 and 2016. Where appropriate incentives were in place, people bought vehicles with lower CO2 emissions. However, other factors such as availability of new technologies and economic conditions were also important. Policies must be carefully designed to avoid rebound effects and unintended adverse impacts such as increased emissions of other pollutants. Reducing greenhouse gas (GHG) emissions from the transport sector is a key priority for the European Union (EU). A new study form the European Environment Agency’s (EEA) European Topic Centre on Air pollution and Climate change Mitigation assessed the impact of taxes and incentives on purchases of new cars. Average CO2 emissions of new passenger cars in the EU has fallen steadily in recent years, from 170 g CO2/km in 2001 to 118 g CO2/km in 2016, with an annual reduction rate of 2 %. A further 19.5 % reduction in average CO2 emissions will be required to comply with the 2021 target of 95 g CO2/km (27 % below the 2015 target). There is substantial variation between countries, in terms of their average CO2 emissions and the rate of reduction seen over time. 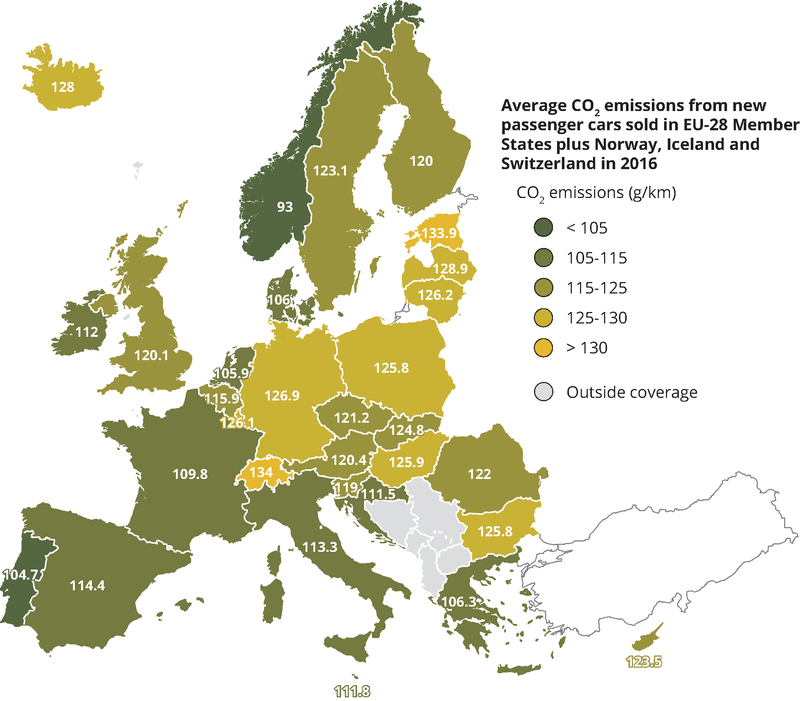 Portugal had the lowest average CO2 emissions of the EU-28 countries in 2016 of 105 g/km, followed by the Netherlands, Denmark and Greece, compared to the highest value of 134 g/km in Estonia, followed by Lithuania. As regards EEA member countries, the average CO2 emissions of new cars was the lowest in Norway (93 g/km) whilst the highest average CO2 emissions were in Switzerland (134.0 g/km). infrastructure - government funds for the installation of refuelling and charging facilities for low emission vehicles. All of the 32 countries implemented at least one type of tax or incentive aiming to encourage the uptake of passenger cars with lower CO2 emissions. However, some countries such as Bulgaria, Estonia the Czech Republic and Poland, had relatively few incentives. Almost all countries (29 out of 32) provided incentives encouraging the uptake of efficient conventional vehicles and of zero- or low emission vehicle technology (Battery electric vehicles (BEVs), Plug-in hybrid electric vehicles (PHEVs) and Fuel cell electric vehicles (FCEVs)). In order to successfully foster the uptake of electric vehicles, sufficient charging infrastructure is required to give people the confidence that fully electric vehicles will reliably meet their travel needs and help reduce anxiety linked with possible limitations in range. In 2016, a specific incentive for electric charging infrastructure was found in only 11 countries. Taxation and incentive programmes can differ in several aspects which may affect their effectiveness in reducing average CO2 emissions, including the number and monetary value of incentives on offer, their placement in the vehicle life cycle (one-off incentives on acquisition versus recurring incentives), the type of owner they target (private individuals versus companies), and the type of vehicles they favour (efficient conventional engine, hybrids, electric vehicles). Table 1. Summary of the presence/absence and the number of taxes and incentives available by country to encourage purchase of cars with lower CO2 emissions in 2016. *A higher number of incentives does not necessarily imply them having a higher monetary value. Turkey was outside the scope of the report. There was relatively little change in the number of countries employing taxes on acquisition or ownership graded by CO2 or a related parameter (such as engine power) during the period 2010-2016. However, for company car taxation there was a rise in the number of countries using CO2 or a related parameter, from 5 in 2010 to 10 in 2016. The number of countries offering incentives for BEVs, FCEVs, and PHEVs increased considerably over the same period. Overall, this suggests that incentives have become broader and more comprehensive over time. Although the presence or absence of CO2 based taxes and incentives was relatively stable, the boundaries between tax bands and the monetary value of incentives have shifted over this period in many countries. For example, in the Netherlands the maximum CO2 emission value for exemption of petrol cars from registration tax moved progressively downwards over the period, from 110 g CO2/km in 2010 to 50 g CO2/km in 2016. Seven case studies were chosen to explore different approaches used for taxation and incentives across different European countries (France, Germany, Greece, Ireland, the Netherlands, Norway, Poland) having seen differing trends in average CO2 emissions or uptake of low-emission vehicle types. Where there were sufficiently large and targeted taxes and incentives in place, consumer adoption of lower CO2 emitting vehicles followed. Norway has the highest proportion of BEVs in Europe (almost 16 % in 2016). This reflects an active, long term policy of relevant tax exemption, covering vehicle acquisition, ownership, charging infrastructure, as well as exemptions from toll and ferry charges. These benefits have ensured that the cost of BEVs and PHEVs is comparable to a similar conventional vehicle. As a result, Norway also had the lowest average CO2 emissions from new cars in Europe in 2016, at 93 g CO2/km. In the Netherlands, over the last 10 years, average CO2 emissions have fallen more rapidly than the EU average. Since 2008, purchasing a CO2 efficient car has been encouraged through favourable registration and annual circulation tax structure. Since 2010, the tax system has also favoured electric and plug-in hybrid vehicles, and in 2016 the Netherlands had the highest share of these vehicles (6 %) in new car sales of the EU-28 countries. Around 15-20 % of the reduction in emission rates over the period 2005-2012 are due to CO2 based taxation (Kok, 2015 and Cambridge econometric, 2013). France has seen a steady fall in average new car CO2 emissions since 2001, remaining below the EU-28 average. The decline accelerated in 2008, alongside introduction of a bonus-malus scheme penalising purchases of high-emission vehicles and rewarding lower-emission vehicles. From 2007 to 2009, the average emissions dropped by 8.7 g CO2/km, 90 % of which can be attributed to tax reform. In Ireland, registration tax and annual circulation tax have been based on CO2 emissions since 2008. Before then, average emissions of new cars sold in Ireland were well above the European average, however since the introduction of taxes, emissions have dropped more quickly. This reduction was achieved by rapid dieselisation (from 27 % of new cars in 2007, to 70 % in 2016), due to the generally lower CO2 emissions of diesel cars. On the other hand, diesel engines produce more NOx and particulate matter than petrol engine If vehicle taxation systems are based on CO2 emissions alone, without additional consideration of other pollutants, this can adversely affect air quality, especially in urban areas. In contrast, where there were more limited taxes and incentives in place, the rate of emission reductions was lower than the EU average. Average new car CO2 emissions in Germany were 9 grams above the EU-28 average in 2016. There are several possible reasons for this, including the high average mass and power of the German car fleet, low annual circulation tax, and the high share of company cars in the fleet (66 % in 2015). Poland has seen a slower reduction in CO2 emissions from new cars than the EU-28 as a whole, moving from well below the average in 2004 to 8 g/km above the average in 2016. No taxes in Poland are explicitly focused on CO2 emissions, and although the registration tax is based on engine capacity, its categorisation does not give additional incentives for the best performing car. The case studies also highlight the importance of country context. In Greece, the economic crisis played a role in the adoption of cheaper, lighter vehicles. CO2 emissions from new cars were the fourth lowest in the EU-28 in 2016, at 106 g CO2/km, having been above the average until 2010. Finally, the case studies also illustrate the wider impacts of vehicle taxation. One example is the risk of additional vehicle mileage if less costly vehicles result in increased vehicle ownership (so-called “rebound effects”). In the Netherlands, it is estimated that tax reductions for small, low-emission cars resulted in additional sales of some 25 000 to 30 000 cars. In France, following the introduction of the bonus-malus system in 2008, sales of new vehicles increased by 3.5 %, resulting in a tax deficit of EUR 225 million. Meanwhile the example of favourable tax treatment for company cars, implies that if such treatment is not well designed, can lead to an increase in mileage and dilutes the incentives to reduce fuel consumption provided by vehicle taxation. Where there were appropriate levels of taxes and incentives in place, consumer adoption of lower CO2 emitting vehicles followed. This is seen in the case studies on electrification for the Netherlands, Norway, and France and dieselisation for Ireland. In contrast, where there were more limited taxes and incentives in place, as was the case in Germany and Poland, adoption rates were lower. The case studies highlight the importance of country context; for example the role that the economic crisis played in the adoption of cheaper, lighter vehicles in Greece. They also illustrate the wider, often unintended, impacts of vehicle taxation. These unintended impacts range from the potential for additional vehicle mileage and associated impacts on CO2 emissions if less costly vehicles result in increased vehicle ownership (“rebound effects”) to the potential for air quality impacts of increased dieselisation. Reducing GHG emissions from the transport sector is a key priority for the EU. Transport has not seen the same reduction in emissions as other sectors. Emissions from transport in 2015 were 23 % above 1990 levels despite a decline between 2008 and 2013. Road transport accounts for more than 70 % of all GHG emissions in the sector in 2015. Cars, which are responsible for 44 % of the emissions of the transport sector, were 16 % above 1990 levels in 2005. Passenger transport demand, measured in passenger-kilometres, grew by 12 % since 2000. A key mechanism for reducing carbon dioxide (CO2) emissions from cars is the Regulation (EC) 443/2009. This set a target of 130 g CO2/km to be met by 2015, and a further target of 95 g CO2/km to be met by 2021 (phased in from 2020). It also placed an obligation on vehicle manufacturers to achieve an average CO2 emissions’ performance for the vehicles they sell in Europe. The European Commission’s evaluation study suggests that the CO2 Regulation on cars is likely to have accounted for 65- 85 % of the reductions in tailpipe emissions achieved following its introduction. Last November, the European Commission presented a new legislative proposal for new CO2 emission standards for passenger cars and vans in the EU for the period after 2020. It has been submitted to the European Parliament, the Council, the Economic and Social Committee and the Committee of the Regions for further consideration under the ordinary legislative procedure. In this briefing, when CO2 emissions are mentioned this refers to type approval emissions i.e. those measured in laboratories rather than in real world conditions. Monitoring CO2 emissions from new passenger cars and vans in 2016 European Environment Agency (EEA) is supporting the Commission in the monitoring of the CO2 performance of passenger cars and vans, according to the European Regulations (EC) 443/2009 and (EU) 510/2011. Countries Find content that is specific to a country or a region in Europe. For references, please go to https://www.eea.europa.eu/themes/transport/vehicles-taxation/appropriate-taxes-and-incentives-do or scan the QR code. Do lower speed limits on motorways reduce fuel consumption and pollutant emissions?